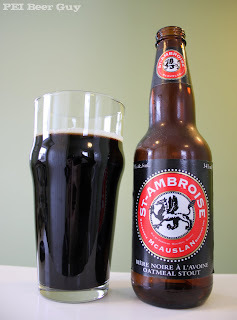 I have had several different beers from the Brasserie McAuslan / McAuslan Brewing Inc. in Montreal, but never have I reviewed one on here yet - time to revisit one for the ol' blog! I first had this St. Ambroise Oatmeal Stout over a year ago, and must say I loved it. I am glad that the liquor stores now stock it as a single (for $2.29, I think). McAuslan's site doesn't list PEI as having it, but we do. So... how is it the second time around, more than a year later? This beer pours so black. It's very dark, even coming out of the bottle. There is less head this time - next to none, really (maybe it's the glass' fault). So... the lacing I got last time is non-existent this time. The smell of it is as I remembered. It's strong, with notes of espresso/coffee, dark, bitter chocolate, and almost a bit of smokiness or earthiness. The flavour is about what I remember, too. You definitely get the essence of oatmeal in it, but what dominates the flavour is the chocolate and coffee. I find it a little sweet this time - more milk-chocolaty than it was before, giving the feeling under the tongue that something like that does. It tastes and smells very nice on the exhale - like a mix of the coffee and a bit of chocolate, with some notes of wood in there, too. The first time I had it, I found the carbonation a little sharp. This time, I found it to be more balanced. Since the body is a little light, the carbonation suits the overall feel. As a stout, I'd still rather something a little thicker or more chewy, but its lightness keeps it very drinkable and more accessible to new drinkers, I'm sure. Although it's only 5% abv, its flavour and feel are strong strong enough to remind me of something stronger, like a couple of Russian Imperial Stouts I have had. Its flavour is a little closer to something like Young's Double Chocolate Stout, though, without getting too sweet (like a milk stout brewed with lactose). So, overall, a very good beer. I don't think I liked it as much as my first one, but it was still well worth coming back to.